Dr Alister MacKenzie, most famous for his work at Augusta National, was also responsible for the design of an incredible selection of top courses in the UK and Ireland, Australia and the USA. When the world’s best golfers arrive at the majestic Augusta National for the Masters, they will tread fairways and fire into greens created by a Yorkshire born Scot called Dr Alister MacKenzie. Between 1907 and his death in 1934 he became one of history’s most skillful and prolific golf course architects. Although this was his first project, the hallmarks of his later works are in full evidence. As he would explain in his book, “Golf Architecture,” MacKenzie believed emphasis should be on the natural beauty of the terrain rather than artificial features. At Alwoodley it’s predominantly the gorse, heather and trees providing protection for the course. The greens are also an early example of MacKenzie’s style – again making use of the natural terrain but sizeable and undulating, testing but fair. The layout of Alwoodley is principally “out and back,” though not every hole follows this pattern, especially on the front side. Later MacKenzie courses tended to feature two nine-hole loops, to create different wind conditions through a round. There’s an interesting feature around the turn at Alwoodley – from holes 7-11 (off the white and blue tees) you don’t play a par-4. The stretch certainly complies with MacKenzie’s principle that every hole should have a different character. The toughest section of the course is the run back towards the clubhouse. The last six holes play into a prevailing wind blowing off the moors. From the 13th to the 18th there are four par-4s over 400 yards. After his success at The Alwoodley, MacKenzie didn’t have to look far to find his next commission. He was employed to design a course at Moortown GC, barely half a mile from his first project. He was struck by the land available and set about creating 18-holes that blended seamlessly into the surrounding heather, pines and birches. The course opened the following year. The bunkering at Moortown provides an example of MacKenzie’s technique. The traps are links-like, making use of the land’s natural contouring. These may be artificial hazards but they appear to have been carved out of the terrain rather than clumsily thrown in as an afterthought. The greens at Moortown are large and undulating, again echoing those to be found at seaside courses – a typical MacKenzie trait. He was a great admirer of the Old Course at St Andrews. Although the term “MacKenzie green” is much used, it’s difficult to give a precise definition of the phrase. MacKenzie’s key philosophy when it came to green design was consistent with his approach to course design in general, ie. – each should appear natural by blending into its immediate surroundings (remember his skills in camouflage.) This meant each putting surface he created was unique. What can be said is, although some are plateaus and others two or three tier, his greens are generally undulating and feature testing borrows. From 1910 until the outbreak of the First World War, MacKenzie was in high demand and was involved in the construction or remodelling of a number of layouts in Yorkshire and further afield. Among others, these included – Harrogate, Sitwell Park, Reddish Vale, Leeds and Headingley. After the Great War, during which he received a commission with the Royal Engineers, MacKenzie quickly returned to course architecture and, in 1920, he entered into partnership with another of the day’s great architects – Harry Colt – the association would last until 1923. One of MacKenzie’s fundamental principals as an architect was to build courses for the most enjoyment for the greatest number. He believed each golfer should be tested without finding the course an impossible challenge. Nowhere is this more in evidence than at Cavendish Golf Club in Derbyshire. Designed by MacKenzie in 1925 (a private commission from the Duke of Devonshire,) the layout makes excellent use of the natural terrain with each hole delivering a unique and interesting challenge. Although it measures just 5,721 yards, Cavendish provides a suitable examination for even the most accomplished player. The fact the course has remained virtually unchanged since the mid 1920s gives clear indication of how skilful MacKenzie’s design was. Further evidence of the longevity of MacKenzie’s architectural principals can be found at Littlestone GC in Kent. He was invited to modernise the links in 1922 though some of his recommendations caused controversy at the time. But they were not forgotten and, in 1931, his plans for the 16th and 17th holes were carried through. It wasn’t until 1970 that his intentions for the 2nd were realised and, those for the 3rd weren’t implemented until 1996! Scarborough South Cliff is another course that remains true to MacKenzie’s ideals. Designed by the great man in 1921, the layout has minimal rough and generous, though tricky, greens. Perched on the cliffs with views towards Scarborough town in one direction and of the rugged coastline in the other, this is a stunning setting for golf. MacKenzie was able to make use of the terrain and the seaside turf to create a course delivering natural beauty and superb variety. In 1927 MacKenzie travelled to Lahinch in Ireland. His re-design of the famous links is one of the finest examples of his architectural prowess. His use of natural slopes and raised greens created a superb and rugged test of links golf. It’s testament to MacKenzie’s ability as a designer that, from October 1999, the club embarked on an ambitious project to restore the MacKenzie characteristics of the course. Vast sand hills, terrifyingly quick greens with perplexing contours and run-offs, un-reachable par 5’s and reachable par 4’s, blind tee-shots, blind approaches, tight lies, perilous bunkers and the smell of salt on an ever-present breeze – Lahinch’s variety epitomises MacKenzie’s ideals for a golf course. 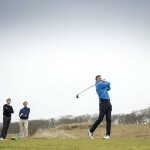 It’s unadulterated golf making the very most of the natural terrain, providing a fair test for every standard of golfer. MacKenzie would approve of the sympathetic alterations completed at Lahinch. It’s, perhaps, more than can be said for how he might view modern-day Augusta. In January 1926, MacKenzie left Southampton bound for New York. His final destination was the Californian coast and a new project at Cypress Point. MacKenzie would spend much of the remaining eight years of his life travelling during which time he worked on some of the world’s best-known golf courses. October 1926 – MacKenzie travelled to Australia and was responsible for the design of the West Course at Royal Melbourne. Upon leaving the continent he left Alex Russell in charge of the project. November/December 1926 – Also in Australia, MacKenzie advised on work to be completed at Royal Adelaide GC and Royal Sydney GC. March 1927 – MacKenzie was in California and completed his design for the magnificent Cypress Point. Opened for play in 1928 it’s widely considered to be amongst the finest golf courses in the world. August 1929 – Pasatiempo Golf Club, California. A beautiful layout where MacKenzie made his American home, it still borders the sixth fairway. MacKenzie would die there in 1934. Autumn 1929 – Crystal Downs, in Michigan. Designed in association with his colleague Perry Maxwell, it has stunning views of Lake Michigan and Crystal Lake. July 1931 – Bobby Jones had first met MacKenzie at the 1926 Walker Cup and the great amateur developed a profound respect for MacKenzie’s work. He decided the Doctor was the man to assist him in creating a new course in Augusta Georgia. 1933 – Augusta National opens for play and the following year the first Masters Tournament (Augusta National Invitational) is held. With its creeks, dramatic changes in elevation and fiercely undulating putting surfaces, it has become one of the most recognisable golf courses in the world.